Ideally suited to either couples or single person travel, the sportliners weight and design is great for fuel economy. 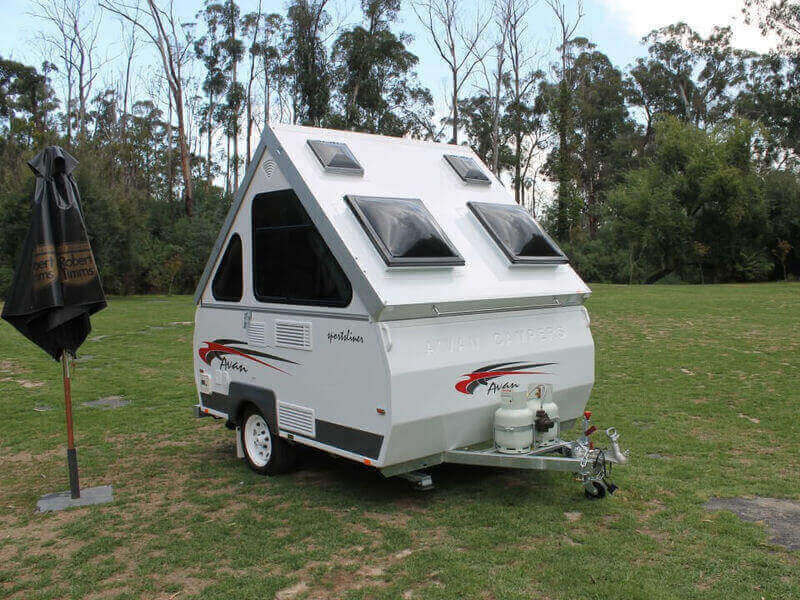 Its effortless spring assisted fold up roof, makes it a breeze to tow with its light weight and low profile. Now available is three layout options, Sportliner, Sportliner CL, Sportliner SB. All Avan sportliner’s comfortably sleep 2. The sportliner is fully insulated for all season comfort, with tinted windows, full 12 volt power supply, 90 litre 3 way fridge, electric hot water service, two burner cooktop, auxiliary battery pack with charger, large dome, deluxe floor coverings and earth leakage protection all as standard, your van is ready to go anytime. Outside the sportliner van standard features include hot dipped galvanized centurion chassis, super strength smooth panel construction, effortless spring assisted fold up roof, low profile for easy towing, two piece arched door entry, anodized aluminium extrusion, one pice flooring, 2 x 4 kg gas bottles, sports wheels, mounted spare wheel plus many more features.